Our Oscars Challenge has come to a close, and we have a list of our winners posted for you below. For those of you who missed the promotion, Silver Oak was offering players the opportunity to guess who they thought would win the Oscar for the three major categories, Best Actor, Best Actress, and Best Picture. Every nominee in each category had their own coupon code and any player who redeemed the coupon of the winner in a category won a free casino chip for their correct guess. You can read our Oscars Roundup to catch up on the action or check out our Casino promotions page for more promotions. 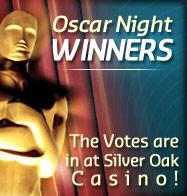 If you missed out on the Oscars Challenge, check the Silver Oak Casino Promotions page for more offers. Right now you can win $1000 CASH in The Bachelor season finale cash giveaway!